Rediscover the pleasure and satisfaction of baking your own bread. 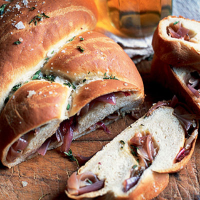 Our crisp, crusty plait is simple to make and delicious to eat – especially when served with a hunk of cheese. Mix the flour, yeast, celery salt and cheese in a bowl. Add 3 tbsp of the oil and about 325ml of hand-hot water. Mix to a soft, but not too sticky, dough. Turn out onto a lightly floured surface and knead for about 10 minutes, until smooth and elastic. Put in a lightly oiled bowl, cover with clingfilm and leave to rise in a warm place for about 1 hour until the dough has doubled in size. To make the filling, heat another 3 tbsp of the oil in a large frying pan and stir in the onions and caster sugar. Fry for about 15 minutes, turning frequently, until they’re soft and lightly caramelised. Chop the thyme and add to the pan with the garlic and plenty of black pepper. Cook, stirring, for a couple of minutes. Spread over a baking sheet to cool. Grease a large baking sheet. Punch the risen dough to deflate it and turn out onto a floured surface. Divide into three. Roll each piece into a long, thin strip, measuring about 35 x 10cm. Spoon the filling down each strip to within 1cm of the edges. Lightly dampen one long side of each strip and bring the sides up over the filling, pinching the dough firmly together. Turn the strips over so the joins are underneath. Starting from the centre, braid the three strips loosely together, working towards one end. Pinch the ends together firmly. Braid the other half in the same way. Lift onto the baking sheet, tucking the ends underneath. Cover loosely with oiled clingfilm and leave to rise in a warm place for 40-50 minutes until doubled in size. Preheat the oven to 220°C, gas mark 7. Drizzle the dough with the remaining 1 tbsp oil and scatter generously with salt. Bake for 30 minutes until golden. Scatter with plenty of thyme sprigs and bake for a further 2-3 minutes. Transfer to a wire rack to cool. This recipe was first published in Mon Sep 01 01:00:00 BST 2008.